It was the Vernal Equinox on Tuesday and despite all the wintery and bitterly cold wind (a short visit from Mini-beast last week, the cousin of the Beast from the East) it is officially spring and just a little bit warmer today. And, furthermore, with impeccable timing the UK Handmade Spring Showcase went live on Tuesday too. 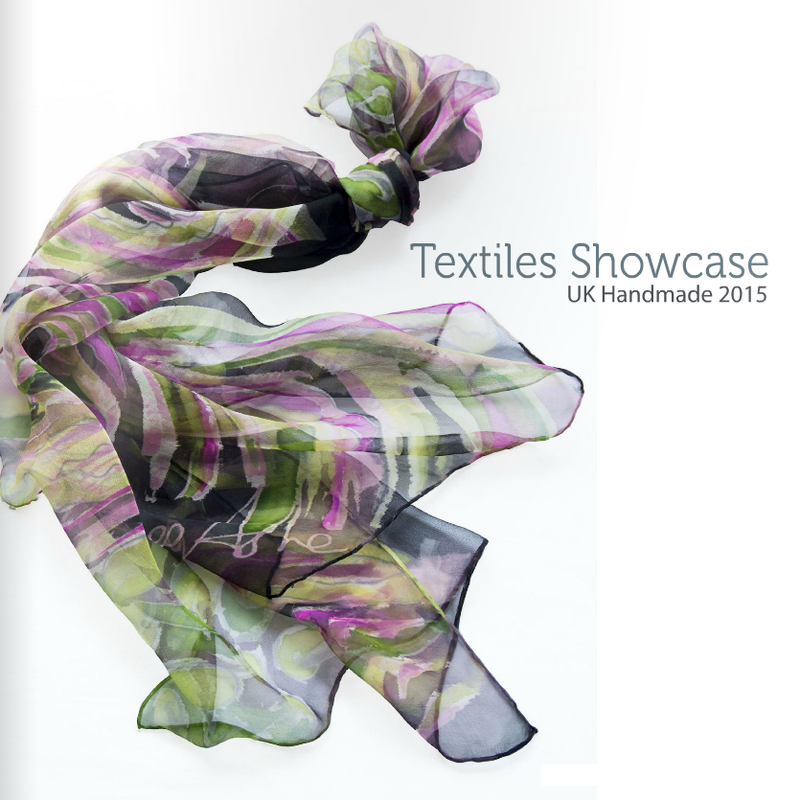 I have been lucky enough to be selected for this showcase and two of my scarves have been featured. I think the two photos chosen are bright and colourful – hopefully capturing that optimism associated with spring. Who doesn’t need some bright cheeriness after the winter? Tudor Bows Blue – hand painted, long silk twill scarf. Most of the scarves I sell are bought as gifts. And, whether my customer is buying from me in real life, or online, I carefully fold each scarf within acid free tissue paper and place it in a box. Now there is more to boxes than just simply being a cardboard container. Originally I chose a pale blue and black box design with a blue and black image on the lid. It was okay, but I always felt the boxes were too deep for a silk scarf. Last year I changed my supplier and now have plain matt black boxes the appropriate depth. Initially, I added my pink and black colourful logo to the lid. However, I didn’t think it really worked, so . . .
. . . for my recent outing selling my work at ‘British Crafts at Blackthorpe Barn’ I decided to change the design for the lid to give a more muted appearance. Mind you, the rest of my display was so full of colour, pattern and ornate props, I doubt anybody noticed the appearance of the boxes! Photographer concentrating on getting the shot, oblivious of me who had just missed the shot!!! I use photographs a lot for my work. I am always looking for inspiration from the world around me and use my camera to capture these moments. Recently, when reviewing and rearranging my current online shop collections, I recognised subtle influences from my photography. I had been searching through my various memory sticks of stored images to freshen up my product listings. It was clear from comparing dates on the files that after a few sessions of photographing some summer garden flowers, shades of peach started to appear in the pink scarf I was painting at the time. Although I was not directly using the flowers photos as source material their influence was quite obvious with hindsight – up until then peach was not included in my work. I also opened my Bury St Edmunds memory stick. There were plenty of photographs of the glorious stained glass in the cathedral, both motifs and colours from the glass I have since featured directly in my silk scarf designs. However, after working in the cooler tones of the glass for a few months I can see I gradually moved to a palette of warm, rich colours. This was not the conscious process as before but I think the beautiful rich red windows had left their mark. Looking at the dates on these files I think the autumn weather was also a factor. It hasn’t only been colourful images that have unconsciously influenced my work. When you are looking for a good shot you examine your surroundings with more attention and details so often overlooked are literally brought into focus. Shapes I hadn’t thought I had noticed at the time have been added to my stock of motifs such as the details on these sculptures. In the end though sometimes there is no obvious inspiration for the colours of a scarf. With one of my favourites, this blue and green scarf below (long sold), I worked up the design layer on layer adapting my choice of dyes after each layer was steamed. A less controlled more serendipitous process. . . . . . . but I had been recently photographing seascapes!!! Change of season and change of mood and I’m feeling like working stripes into my more floral scarf designs. Looking at Mother Nature’s versions of decorative streaks has given me a good place to start. Some variations of Morning Glory have been worth stripping back to a slightly less intricate rendering and then worked with different colour combinations. However, although these ideas would work well if I was screen-printing them onto a scarf, my freehand, painting style needs to have a looser starting point. I thought I’d combine these heavier looking floral shapes with my recent fennel inspired motifs. Here’s work in progress of a version I’ve created combining the two ideas. Just added to my online shop another flat silk crepe silk square working with a stork motif placed within a stained glass window frame. Since I last worked with a stork motif it has greatly changed. Somehow it’s reduced in size and morphed into various stylised shapes of beaks and feathers! However, I think the stained glass influence is still obvious. It is surprising how effective the final addition of green over the various soft golds has lifted the design. When I started my online shop three years ago getting to grips with product photography was essential. I found that photographing my painted scarves to achieve the nearest representation to how they appeared in reality in normal daylight, was a major issue. Cleaner and more accurate colours. 2014 And scarf sold. Recently I attempted to model my own work so I could catch the best ambient light. The colour accuracy of the two examples below is probably the nearest to real life I’ve managed. It was outside with bright, but overcast skies. However, pin sharp focussing proved virtually impossible working on my own with the camera on the timer. And, in the end I discovered that it takes a very special photographer that can make a back view interesting particularly against a bland background. And, that’s not me! Of course not all my work ends up for sale as with any hand process some pieces just don’t make the grade. After steaming I make a close inspection and sometimes a fault previously invisible shows up or water in the steaming process has spoilt the design. Naturally these don’t end up in one of my rag wall hangings like the offcuts do, but instead I wear them in my everyday life. Obviously, these rejects pop up in informal pictures taken by other people. Below, I’m just in from picking up folks at the local railway station! Focus is good, colour accuracy is pretty precise too, but oh my goodness somebody is always pulling a stupid face!!! Then there are the pics taken on other peoples’ mobiles – more silly faces and now poor quality as the images get rendered across different devices. Finally, and oddly for me, one of my more spirited photos showing me wearing my work, is a selfie! 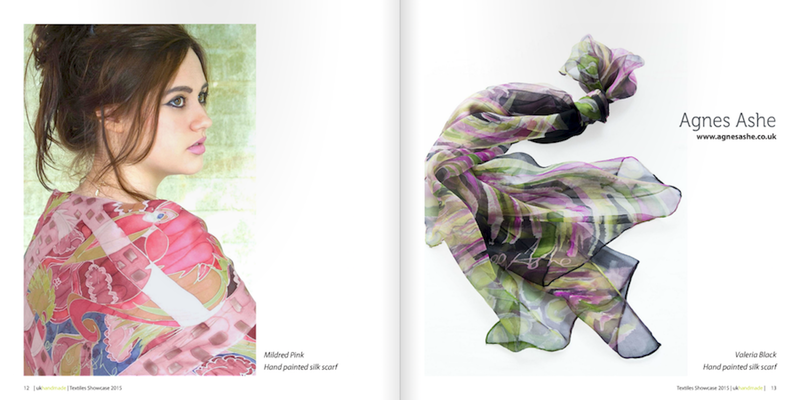 It shows an eccentric use of a couple of my old art silk scarves. Last summer I was turning my compost in the back garden when I unwittingly disturbed the beginnings of a bee colony and had to take some hasty precautions not to get stung to bits. Last weekend I noticed in the supermarket a whole aisle of red and pink stuff. As Halloween is a black and orange affair and Christmas is white, red and green and Easter has been yellow for decades, it is now usual to colour-code Valentine’s Day. That’s red and pink. With a couple of weeks to Valentine’s Day there’s going to be plenty of red and pink in the shops. Not wanting to buck the trend or frighten the horses I’m posting photos of some pink and pinkish scarves. Pink for your Valentine is, apparently, the order of the day. I do have some red scarves too, but pink, especially pale pink, is often more flattering particularly when worn near the face. It’s been an odd few weeks. The weather here in East Anglia as with the rest of the UK has been incredibly mild for December. There’s talk it will be the warmest December for over 70 years! Needless to say the garden has a few plants still blooming and some bursting forth completely at the wrong time of year – an early summer hardy geranium is coming into flower. I’m currently working on a couple of long silk twill scarves and belatedly noticed that I had chosen a palette that was a reflection of the colours outside my studio/office window. I hadn’t actively looked for inspiration from the garden. I simply felt I wanted to work with rich browns and muddy greens and soft muted pinks. Don’t you just love our flexible outlook on life? Most of us have that strange ability to hold two totally opposing views at the same time. Here on Planet Earth we happily buy and sell to each other all round the globe, but at the same time we applaud the idea of ‘buying locally’. Luckily for me my scarves when boxed up are small and light so earlier this year shipping to Singapore was as easy as shipping down the road to the next county. On Monday of this week my work was chosen to appear in the current UKHandmade Showcase ‘Textiles’. 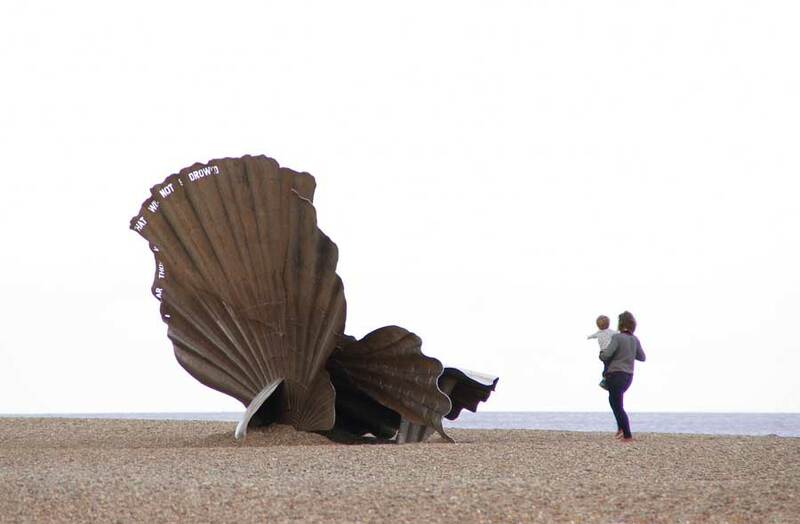 This 4 metres tall, steel sculpture is a tribute to Benjamin Britten. The words “I hear those voices that will not be drowned” from Peter Grimes are cut into the steel. Made by Aldeburgh craftsmen Sam & Dennis Pegg. Hand painted and steam fixed chiffon scarf Valeria lilac. Silk chiffon is a beautiful fabric to work with and a luxurious fabric to wear. The sheer, diaphanous quality allows a scarf to appear fluid subtly changing colour as it passes over your skin, your shirt or your dress. Hand painted chiffon scarf Valeria black. 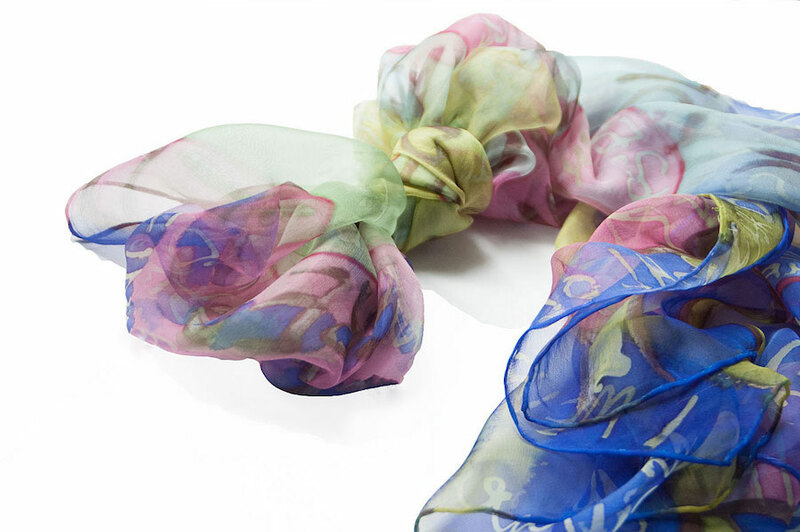 A bright, eye-catching chiffon scarf can add an elegant, stylish accent too. 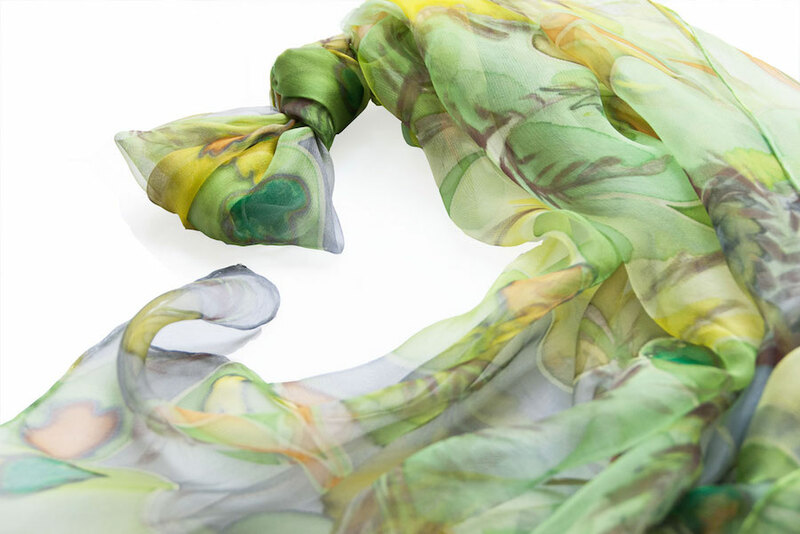 Soft lime and grey silk chiffon scarf Valeria lime. 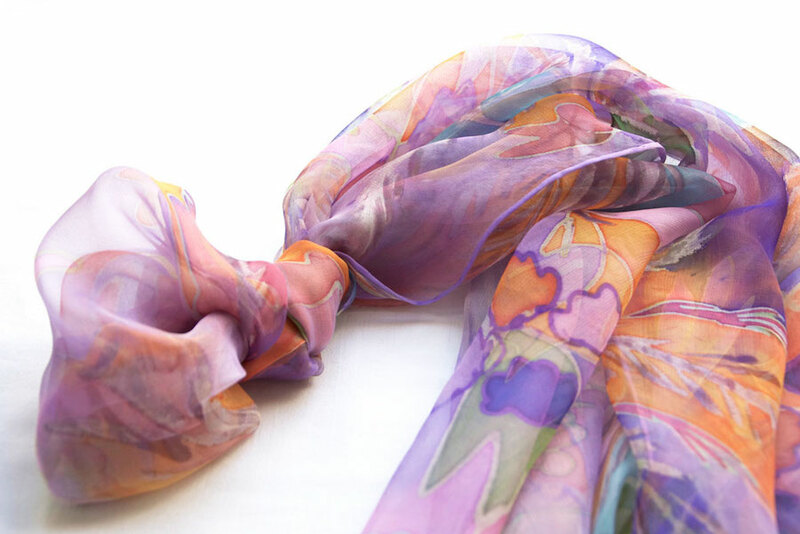 My colourful and somewhat quirky Lorina Words chiffon scarf has just been uploaded to my shop. It was inspired by the long, long needlework pieces patiently embroidered by Lorina Bulwer see previous posts ‘Words, words, words’ Part 1 and Part 2 for further details about her life and work. Lorina Words chiffon scarf inspired by the Victorian needleworker, Lorina Bulwer (1838-1912). 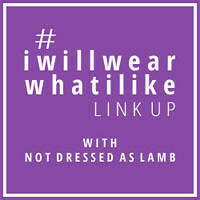 And, finally, I’d just like to thank the fashion blogger, Catherine Summers, from Not dressed as lamb and her Instagram link up which prompted me to revisit ‘Sheer’.